Check out the original, linked above, for details. 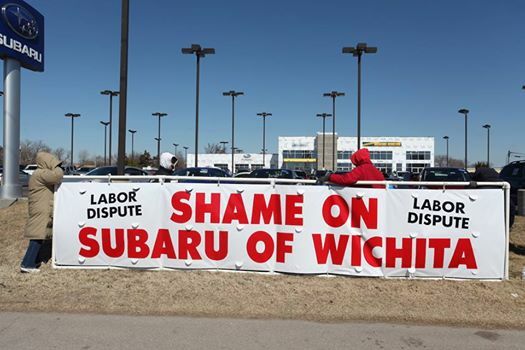 But what I want to ponder here (beyond this dealership’s pitch- perfect reaction) is the nature of the union protest. The job went out for a competitive bid. The dealership gave the contract to the lowest qualified bid. Carpenters Local 201 lost. They simply lost the bid, that’s all. Someone else got the job. Let this be perfectly clear. The term “labor dispute” conjures up mental images of management breaking contracts, failing to pay agreed-upon wages, things like that. That is not what happened here. They simply put out a contract for bids, and hired the people they thought best, and those that didn’t get hired are responding by attempting to harm their business in revenge. In what context is this acceptable? Is this grade school? Are unions run by children? When I graduated college, I applied for a slew of retail and service jobs. I got called by some, not by others. Would it have been reasonable for me to then blow up one of these rats in the parking lot of Barnes & Noble? I imagine I would get arrested. Or sued. And I would deserve it. I don’t necessarily have any sort of ideological or philosophical problem with private individuals unionizing. I do have a problem with individuals being coerced into joining a union against their will. And I do see major problems in the nature of a public sector union, as did progressive pro-labor pioneers such as Franklin Roosevelt and Fiorello LaGuardia. These are topics I hope to look at in greater depth. I definitely have a problem with bully tactics meant to intimidate. Can we at least all agree that blowing up a giant inflatable rat to scare off customers and intimidate employers–just because they hired someone else–is unacceptable? I’m always hearing about how bullying is bad. Let’s lead by example, ok? This entry was posted on April 1, 2014, 9:11 pm and is filed under Conservative Politics, Discussion. You can follow any responses to this entry through RSS 2.0. You can leave a response, or trackback from your own site. Unions have a huge history, and very controversial use. Unions were designed to protect – but have changed into fairness between one-another against seniority. The perks are that there is a distinct list of rules that both parties have agreed to. Costs tend to go up, and sometimes “just do it ” tasks become delayed.